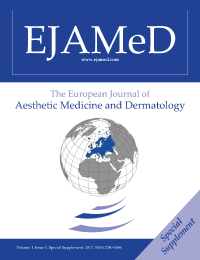 Exclusively devoted to aesthetic medicine and dermatologic practice, EJAMeD publishes the most clinically comprehensive and up-to-date information in its field. This quarterly journal will provides most expansive and in-depth coverage of cosmetic medicine and dermatology, through peer-reviewed original articles, case reports, Technical innovation, litterature reviews, and correspondence. Volume 1, Issue 1, Special Supplement, 2017.